Please rate and review our app to let others know your feedback and also to help us to further improve our converter app. If you had any issues using the app please first read the help documentation and watch the video demonstration which may help. Please note we cant guarantee functionality on all phone models so please bear this in mind. Please click on a social widget button below to share 3 Grams Multi Converter app with friends, they will love you for it! 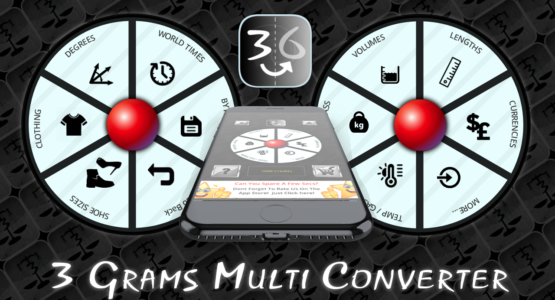 3 Gram Multi Converter App – the best all in one converter app for mobiles.